Recently, two of my pals and I decided to meet in Playa del Carmen for a guys’ getaway. While most of our days were spent exploring ancient Mayan ruin sites and local cenotes, one friend was anxious to book a tour to dive with the bull sharks. 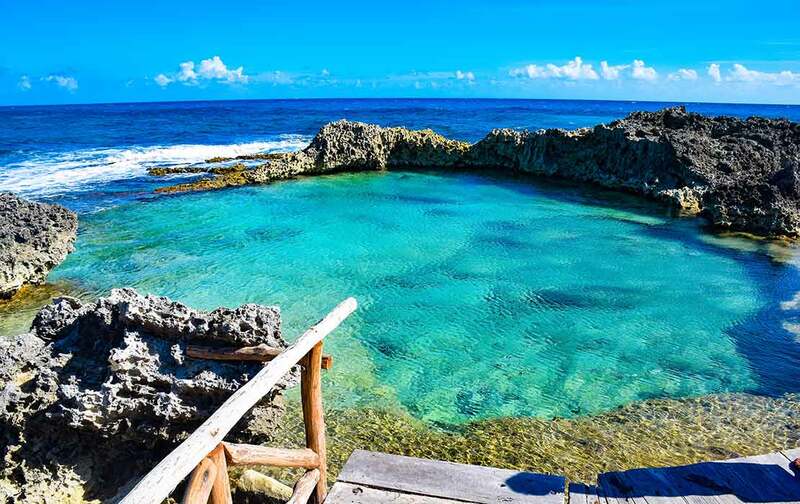 Although we know Playa del Carmen well, there were too many places that we had only heard about, but never actually visited. So we went on a mission to discover for ourselves, some of the history and unbelievable beauty we had only read about or seen in pictures. Not long after our arrival, we hired a driver to take us on our first adventure. He suggested two options: a tour of Chichen Itza and the other, Coba. In the end, we had the time and decided to do both! My goal for writing this article is to provide key factors with an in depth comparison of the two, to help other travelers choose the best excursion that would best meet their expectations. Chichen Itza is the most famous ruin in Mexico, generating thousands of daily visitors. Being included in the list of UNESCO Heritage sites, Chichen Itza and its famous El Castillo temple deserve a visit. I had understood after hearing from visitors and locals alike, that the crowds, heat, and excessive souvenir peddlers take away from the experience. The historic Mayan city was still something I had to see for myself. Both tours were private and lasted approximately 10 – 11 hours from pick-up to drop-off. We were a small group and decided to go with a private van service so that we’d have the freedom to customize if we felt the need to do so. The large buses, or shared tours, do not allow for this. They adhere to a strict schedule and when the time is up at one stop, it’s time to go, no matter how much you try to coax the guide for more time. 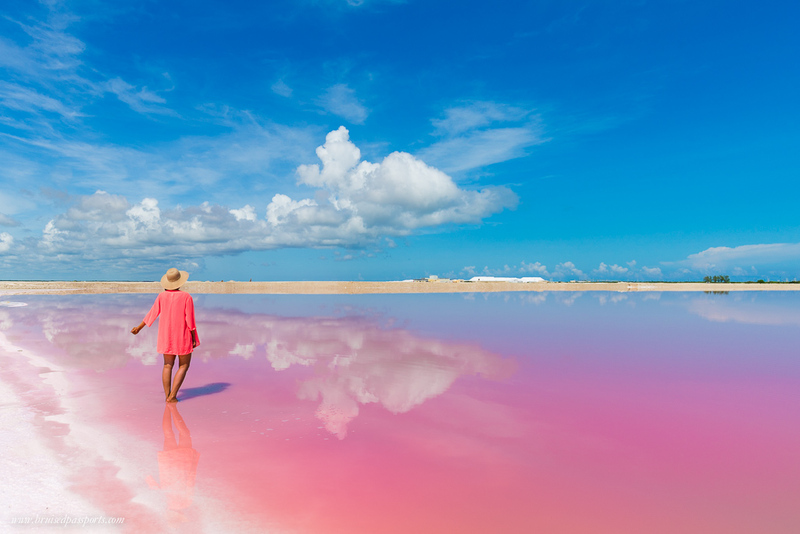 An excursion like this may be a once in a lifetime experience, so having the ability to customize your itinerary can be priceless, not to mention the added bonus of comfort. The first excursion we booked was Coba, Cenote and Tulum. 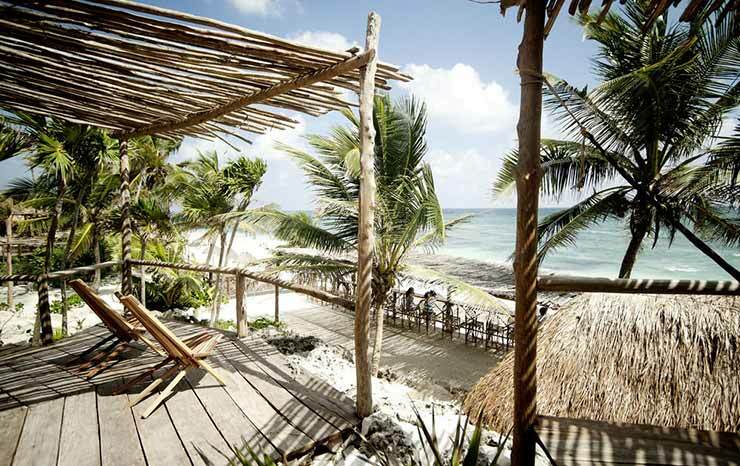 The least important to us was the visit to Tulum, not because we don’t love Tulum, but we had all been there many times. Understanding this ahead of time was beneficial. We left the Tulum portion open, which gave us the option to spend more time at Coba, or explore additional cenotes if we so desired. The drive from Playa del Carmen to Coba took about 90 minutes. Highway 307 South led to a turn off at Tulum where signs clearly direct visitors to head west to Coba. It was a nice drive as we passed through a few small typical Mexican towns, a honeybee farm selling honey and other organic products, and a several roadside fruit stands. We arrived at Coba, purchased the entrance tickets and joined our guide inside. Coba is an extensive, sacred Mayan site spreading over 30 square miles (80 square km), which encouraged us to opt for a guide. The English, Maya, and Spanish-speaking guides are not required. However, since we knew little about Coba, we thought it would be best to hire someone that could share some insider knowledge and facts with us. Our guide Hector was full of information, friendly, and spoke perfect English. We followed him on foot to various remnants close to the entrance. He then suggested we rent bicycles to explore the other areas. Once again, we were happy that we decided on the bike rentals as it was a massive area. You could choose from a rickshaw type tricycle or ride your own two-wheeler around the jungle paths. We hopped on bikes and forged on with Hector leading the way to two ancient ball stadiums and other interesting structures. At this point, we had still not seen any ruins that we were allowed to climb and we were getting anxious. I would estimate we rode the bikes for about a mile before arriving at the best part of Coba. The largest temple challenges visitors to climb the 120 steps to its peak, 130 feet (42 meters) from ground level. I will be the first to admit it was a bit intimidating. The steps are steep and tall, and the climb can be both awkward and a little terrifying for those who have an issue with heights. There is a safety rope stretching from top to bottom running down the middle of the climbing area for those that need extra support. Hector conquered the steps quickly and effortlessly. We took our time and enjoyed the views from different vantage points during the ascent. In all honesty, these pit stops were really just chances to catch our breath. Standing at the top of Nohoch Mul provided an amazing 360-degree view that spanned for many miles in all directions. This temple was spectacular and was the highlight of Coba. Albeit cruising around for the day on bicycles was really fun as well. After spending about 10 – 15 minutes on top we slowly made our way down. We advise other visitors to wear good shoes and to descend slowly as the steps can be slippery. Fun Fact – Coba has the longest sacbe, meaning “white road,” that runs about 62 miles (100km) to the site of Yaxuna near Chichen Itza. These elevated walkways became illuminated by the moonlight and provided for a safer journey at night. We spent extra time at Coba with Hector and were hungry after all of the riding and climbing. The driver took us to a nearby restaurant in the town that overlooked a lake. It was perfect! They offered a variety of local dishes served buffet style. There was soup, salad, a variety of main dishes, and dessert. As we ate, we discussed the local area with our driver/guide and enjoyed the time to relax. After lunch we made our way to a nearby cenote called Choo Ha. There are many options for cenotes in this area. Based on their popularity, we decided to visit two of the smaller cenotes as it meant there would be fewer visitors. 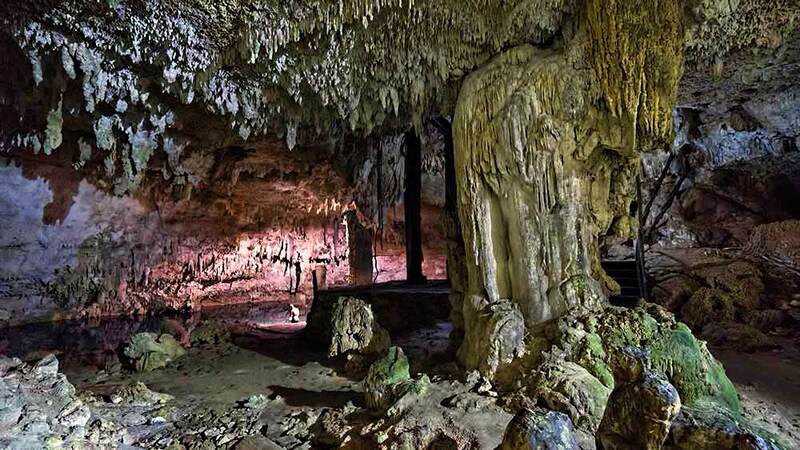 Choo Ha is 60 feet (18 meters) below ground, accessed by a staircase descending through a small opening in the earth. Once we reached below the surface we were able to admire it in its entirety, decorated with stalagmites, stalactites, and columns. 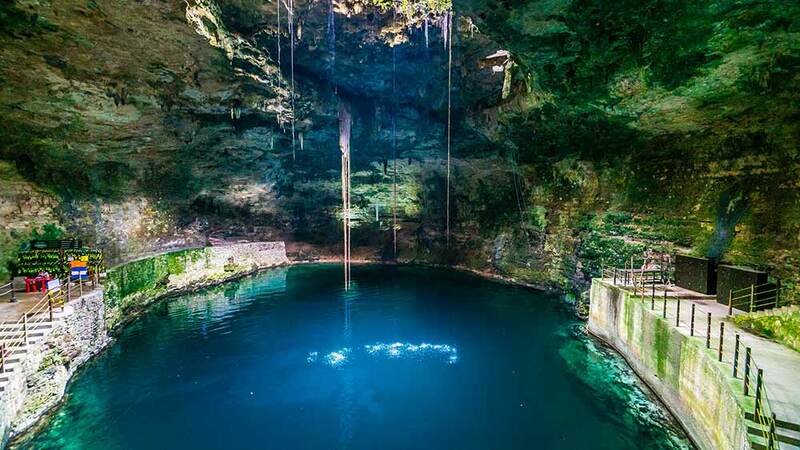 It is a smaller-scale cenote, but a unique marvel just the same. There were only 4 other people in the cenote so it was almost private. Our group then proceeded to a second nearby cenote called Tamchah-Ha. From the outside looking in, it appeared similar to Choo Ha. The splendid cenote had a narrow mouth with a staircase descending underground. But once we reached below the surface, the differences between the two stunning sinkholes were clearly evident. Tamchah-Ha was deep and almost completely filled with water, forming a large natural swimming pool. The unique aspect of the latter cenote, was that it gave visitors the option to jump from two platforms on the staircase. The tallest was approximately 40 feet (12 meters) above the water and the lower about half that height. Part of our gang accepted the challenge and threw themselves from the highest point. It made for a great adrenaline rush for the jumpers and some good laughs for the others. We spent about an hour at each of the cenotes and returned to the van to head back to Playa del Carmen. The tour was a wonderful experience. If we had not been to Tulum before we would have taken advantage of that option as well. Tulum has incredible ruins overlooking the Caribbean Sea and renowned beaches, so we highly encourage at least a day there. The best part of the tour was having the ability to customize as we went along. Private is the best option if you and your group would like to have the freedom to decide as you go! On our second excursion, we visited Chichen Itza, Ik Kil and the Ek Balam ruins. Our driver (Manuel) picked us up in a Suburban at 8:00am. Although an earlier departure of 7:00 a.m. is recommended, we wanted to eat breakfast beforehand. We figured our small group of three could move along a bit faster and make up for lost time. I had heard from a number of sources that it could take as long as 3:30 hours to drive to Chichen Itza. This information was far from accurate as it took less than 2 hours with the new 305 toll highway. It was only a slightly longer drive than to Coba, so that was a welcoming surprise. The new road is better than anything you will see in the States and even features rope bridges above the highway for monkeys to cross safely. Unfortunately we didn’t see a monkey on this trip, but to imagine them making the trek above is pretty cool! We arrived at Chichen Itza just before 10:00 a.m. and quickly realized the difference of visitor volume compared to Coba. Large busses, vans, and cars were already filling up the parking area so we hurried towards the ticket line. There were already hundreds of people in line so it took about 25 minutes to purchase the tickets. Manual had warned us that it would be busy so we expected to wait and it wasn’t a big deal. Our friendly driver stayed with us while we waited and gave advice for after we were inside the park. We decided not to hire a guide at Chichen Itza because it is much smaller than Coba and looked fairly easy to navigate. Even though we would have learned some interesting insights from a professional guide, we felt like we made the right decision to walk through ourselves. Chichen Itza does not have much shade cover and can get quite hot. We suggest applying sunscreen and wearing a hat! An unfortunate and disappointing aspect of Chichen Itza, besides the volume of visitors, is the amount of vendors within the park. There are hundreds of them on-site. Walking on Playa del Carmen’s 5th Avenue and knowing that it’s the main shopping and souvenir district, we expect a few pushy salesmen. But to have so many people within this majestic ancient city bombarding you with their “almost free pitch,” we felt it took away from the natural history component that Coba had successfully maintained. We felt that if they set up in a designated area outside the park it would provide a better experience. We stayed at Chichen Itza for about one hour. Most visitors, according to Manuel, stay for at least two hours but we captured photos and decided we’d like to spend more time at Ik Kil and Ek Balam. Manuel was waiting in the parking lot for us so we loaded up and headed to cenote Ik Kil. We were not expecting the considerable size of cenote Ik Kil. Manuel accompanied us to the ticket counter and once we were inside, we chose to have a bite to eat at the on-site restaurant. It is buffet style service with a number of fresh local choices. We sat at wide farm table seating that we were directed to in order of arrival. I imagine they must handle a lot of daily visitors and accommodate the crowds efficiently with the cafeteria style dining area. It was comfortable and the food was great! We went back to our vehicle to gather our supplies and headed to the cenote. The entrance is impressive at 200 feet (60 meters) in diameter, much larger than any other cenotes I’ve visited. A massive staircase takes visitors 85 feet (26 meters) into the earth. The initial view is almost overwhelming, and I immediately understood why it receives thousands of visitors from around the world every year. Vines dangled from the partial ceiling, flowing elegantly down towards the water, which made for striking photos. 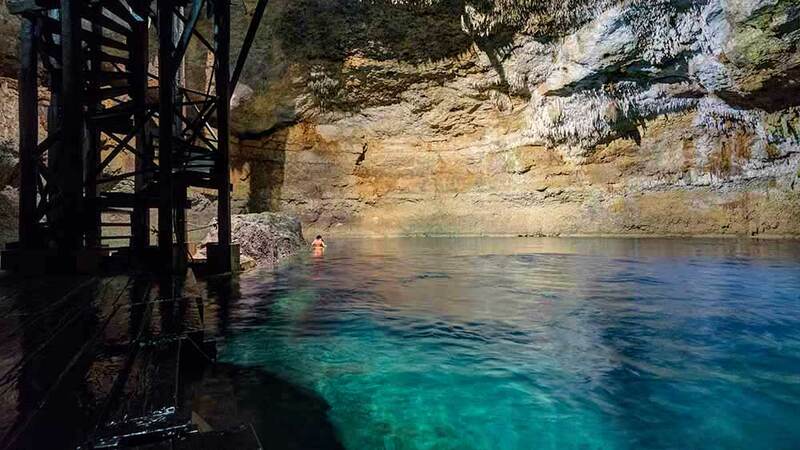 Spectators and swimmers were scattered throughout Ik Kil from the exterior to the interior of this majestic limestone cave. We stopped at each viewpoint to marvel at the scenery until we reached water level. Even though hundreds of visitors were here at the same time we were, it did not become burdensome. People watching became part of the attraction. The water area of the cenote is broad, providing ample room for all swimmers. The temperature is “refreshing”, as the guides always say, making for an exhilarating swim. Ik-Kil is by far the most spectacular cenote I have personally visited and well worth the trip. Ik-Kil is the most spectacular cenote I have personally visited and well worth the trip. 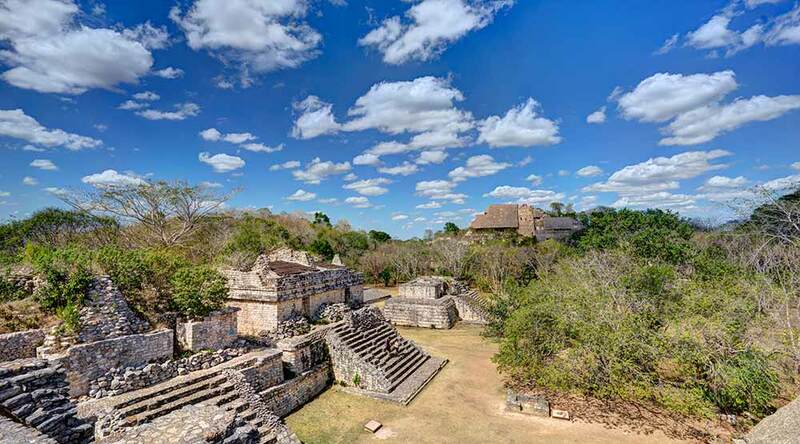 After returning to the earth’s surface at Ik Kil, we made our way to Ek Balam. This was a highly anticipated part of our journey because I had heard from a friend that it was more significant in grandeur than many of the other Mayan ruins. As we arrived, it was a pleasant surprise to see very little traffic. The parking area was quiet allowing us to purchase tickets and make our way inside quickly. Although not as spread out as Coba, Ek Balam is incredible, covering more than 23 acres (9.55 hectares). We were able to climb on, over, and through the different structures to our hearts’ content. There were few visitors in the park and we meandered around until coming upon the main attraction. Acropolis stands nearly 500 feet (160 meters) tall. When comparing it to the largest structure at Coba we all liked it more. It was more magnificent and beautiful than Coba, in our opinions. We stayed in Ek Balam for approximately 90 minutes and then Manuel suggested visiting a nearby cenote called Hubiku. 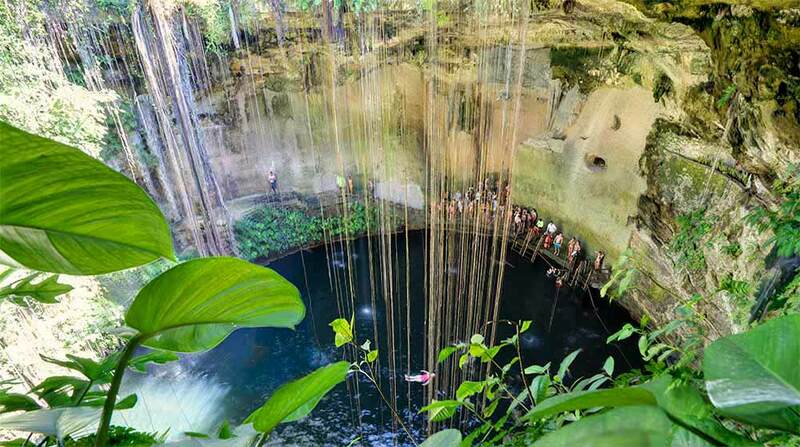 We were thrilled that we took his advice to visit this cenote as we have a feeling it will not stay a secret destination for long. Cenote Hubiku is another magnificent cenote but with few visitors. The property is beautiful with manicured landscaping, stores, and tequila tasting stations. Like all the other cenotes there was a staircase that proceeded down into the earth, opening into a huge cavity. The facilities were well maintained and provided us a wonderful opportunity to enjoy the nature and cool swim. The water was somewhat colder than Ik Kil, probably due to the lack of direct sunlight. When we asked about the water temperature, just like before, the guides said “it is refreshing”. I will stick with that to describe the typical cenote water temperature. We spent about 45 minutes at Hubiku before making our way back to Playa del Carmen. 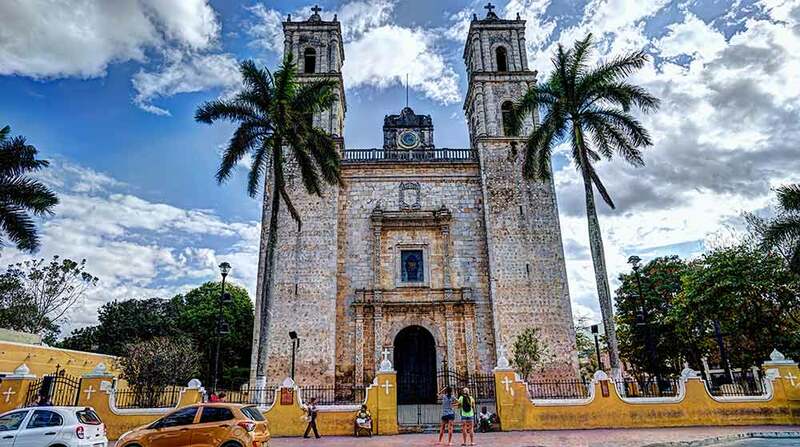 The final stop of the tour was at the historic city of Valladolid, a perfect ending to a memorable day. Manuel stopped in the central park, which is surrounded by 16th century buildings full of colorful personality and rich history. We spent about 30 minutes strolling through the park and capturing photos. 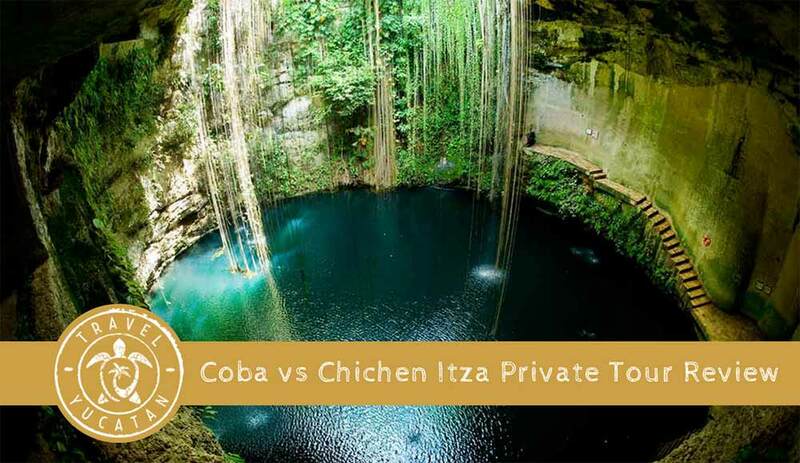 The final conclusion when comparing the Coba tour vs the Chichen Itza tour is difficult. There were aspects of each that we greatly enjoyed. The best advice I can give to travelers would depend on whether crowds and driving distance is important to minimize. If these are in fact a concern the Coba tour is a better option. 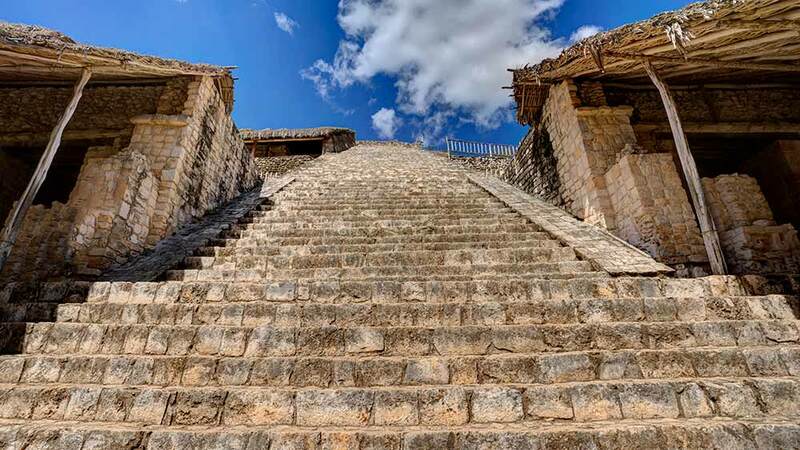 I felt that Chichen Itza was a bit of a disappointment but the other stops included on that tour were top-notch, making it my preferred overall choice. The bikes, restaurant, and quaint cenotes on the Coba tour were enjoyable. The key factor that made both so enjoyable was having them private, allowing us to customize as we went. The final aspect to consider when making your final choice is the price for each. 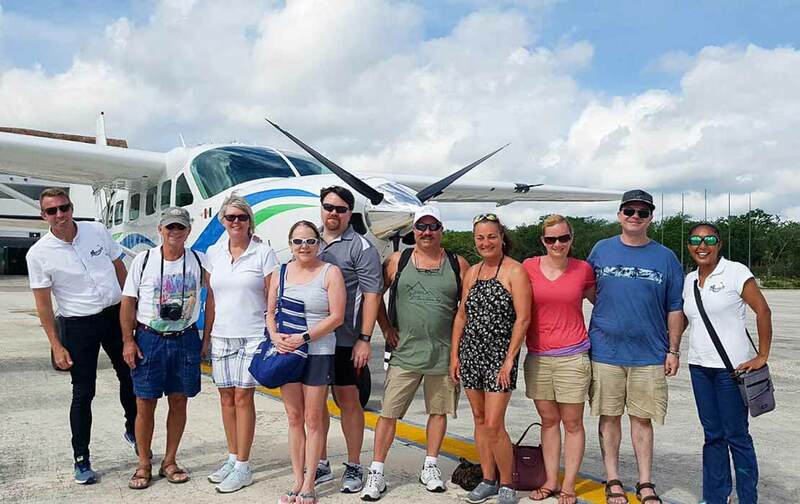 The private Coba tour is about $50usd cheaper than the Chichen Itza tour since the distance is further and toll roads are expensive to cover when driving to Chichen Itza. Both of these private options include the driver and van for the day, along with most toll fees to/from Chichen Itza. Be aware that they do not pay for entrance fees, parking fees, lunch, and some additional fees that may occur if you choose extra stops. The entrance fees for most places was very affordable. The most expensive was Chichen Itza and it was about $6usd for adults. Plan on spending $20usd for entrance fees per adult and $10usd for meals. Children most of the time are either free or half the adult rate. If you were to participate in an all-inclusive bus tour similar to this is would cost around $100usd per adult. If you have four or more in your group the private tour will be a comparable price to the bus tour. This is more expensive for a couple but if you can cover the cost you will not regret it! Marcus has been married to his wife Kristin for almost twenty years and together they now have 2 two sons, Enzo age 8 and Cody at 8 months. 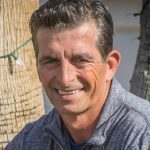 Marcus has spent that last 11 years living full time in Playa del Carmen Mexico with his family and now travels back and forth between Mexico and Scottsdale Arizona. 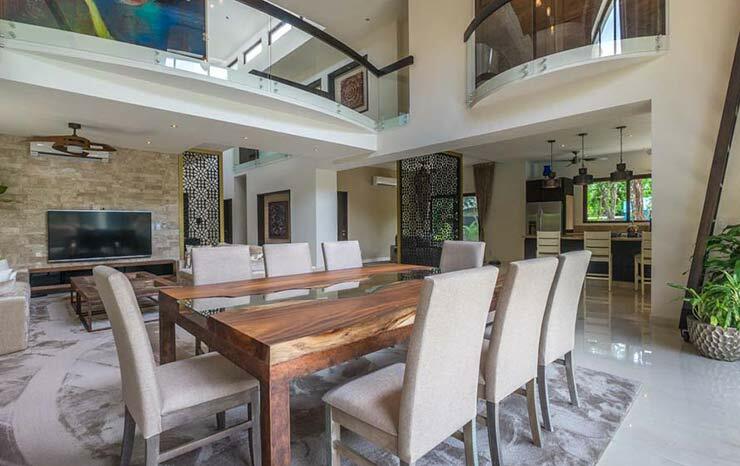 Marcus has been in the International Real Estate and Management business for 13 years in Mexico and prefers to spend his down-time on the golf course with his family and friends.